Database used by LoginCode allows you to create various items which in conjunction with folders make up a hierarchical set of information. You can create any number of folders, subfolders and items to organize your data. 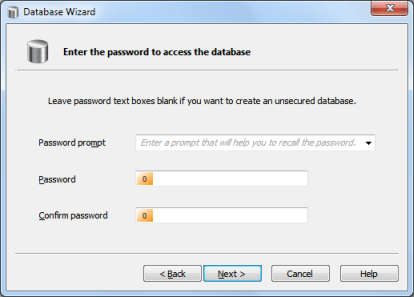 One of the main database features is the ability to define passwords for the whole database and/or folders and items. Such a solution can increase the security of certain folders/items by setting up additional passwords. You can also create the database not protected by any password to be allowed immediate access to a non-essential data. In such an unsecured database, you can still create password-protected folders to store more important information. Working with LoginCode is possible only with properly configured database. Therefore, when LoginCode is launched for the first time, it will ask you to create the database. 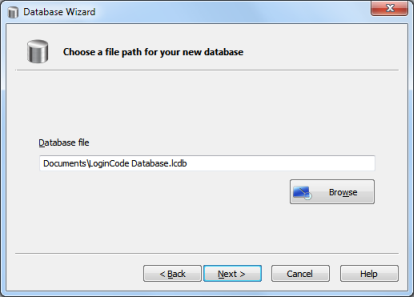 To make this operation as easy as possible, LoginCode offers you the database wizard. 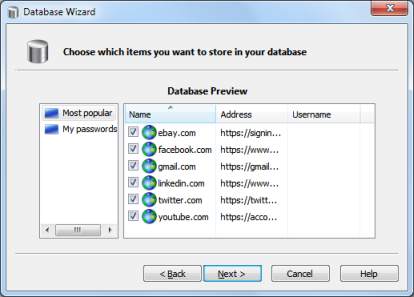 The database wizard is a tool which helps you to define the database parameters. 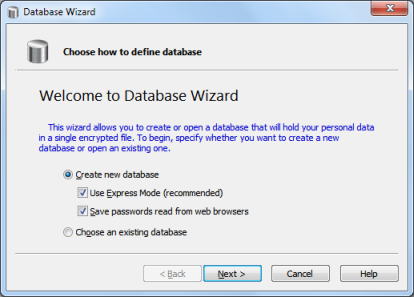 In the first wizard step, select whether you wish to create a new database or open an existing one. When creating a new database, you can also turn on the Express Mode to skip advanced database settings. In addition, you can check Save passwords read from web browsers to capture passwords stored in browser(s), you have used (if any). LoginCode can read passwords from Internet Explorer, Mozilla Firefox and Google Chrome. Settings available only in a non-express mode. In the next step, select a path to the database file. Initially LoginCode selects a file named LoginCode Database.lcdb located in your documents folder. The next step is the selection of cryptographic algorithms. LoginCode initially sets up the strongest algorithms available on your computer. However, if you have an appropriate knowledge, you can choose different settings according to your needs. 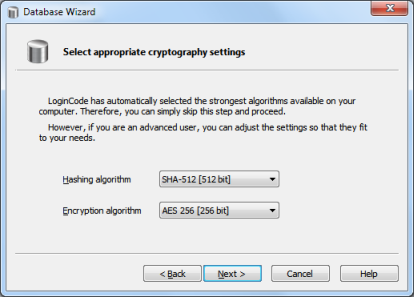 You can find here a general description of cryptographic algorithms. In the next step, select which web login items should be initially stored in the database. You can choose among the most popular websites and items that have been read directly from your web browser(s). The next and final step is the setup of database password. Each time the LoginCode is launched, the database password is required to gain the access. If you want to create a database which is not protected with a password, you can leave the password edit boxes blank. In such a situation LoginCode allows for database access without any prompt. Make sure that your password is strong and easy to remember for you. The only way to access the database is to provide the correct password. Forgetting it automatically makes your database useless with no exception. If you are not sure how to create a "strong password", we recommend that you familiarize yourself with this chapter. When password setup is finished, you will be redirected to the last page which allows to confirm all settings. When you close the wizard, you can start working with LoginCode. LoginCode allows you to import passwords stored in your web browser. To do it, choose Import passwords in Tools menu. The window shown below will be displayed. Before you start the import, select the target folder for passwords. You can both select one of the existing top level folders or type in a name to create a new folder. To start import, press OK button. LoginCode reads passwords from the following web browsers. For technical reasons, passwords importer has some minor issues described below. 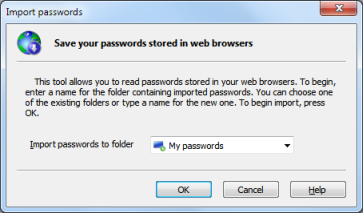 Passwords imported from Internet Explorer versions 7.0 - 9.0 can be read only if the website related to the username/password pair exists in browser history. Therefore, if you find out that LoginCode cannot read some password, visit the appropriate website using Internet Explorer, then close the browser and import the passwords again. When you import passwords from Mozilla Firefox, website addresses are limited to domain name only. For example, if the website address is http://web-service.com/login.php then LoginCode will be able to read only http://web-service.com/. To fix this problem, launch Web Login Edit window and complete the address manually.